A space superiority fighter, the N1 was well ahead of its time. 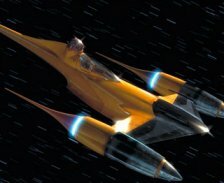 Combining agility, firepower, a deflector shield capable of angling the shields to provide maximum protection, and a array of proton torpedoes, the N1 was an excellent use of Naboo's limited defense capabilities. While expensive, it was years before the rest of the galaxy caught up with this snubfighters efficiency and aesthetic design. May carry up to 6 proton torpedoes at 5 CP each.